This vegan freakshake is the definition of indulgence. 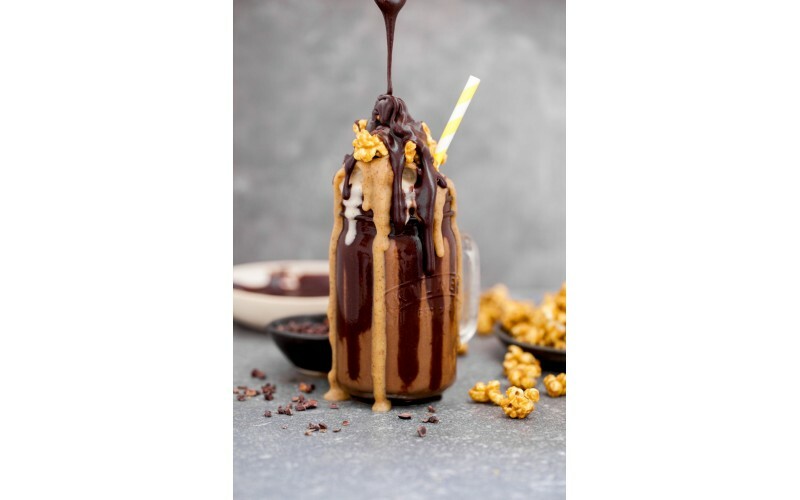 Made with raw chocolate, caramel, popcorn and icecream it’s a shake that’s bound to be loved by vegans and non-vegans alike. While it’s made with all the good stuff, it’s pretty healthy compared to regular shakes as it’s made with all nature ingredients. It’s also refined sugar free but you’d never know it! In a small pan, melt together all of the ingredients for the chocolate sauce. Once melted pour into a small dish and set to one side whilst you prepare the other components. This will allow the sauce to thicken and give you a pourable consistency. Put all of the ingredients into a small pan. Once the cacao butter has melted stir all of the ingredients together and once combined remove from the heat and pour into a small dish. Set aside and allow to thicken, like the chocolate sauce. Heat the cacao butter in a large pan over a medium to high heat. Once the cacao butter has melted add in the popcorn kernels and put the lid on, shaking the pan occasionally to prevent sticking. When the pan is hot enough the popcorn will begin to pop. Leave on the heat until all of the corn has popped then pour into a large bowl. If you leave the popcorn in the pan it is likely to burn from the residual heat. In the same pan gently heat the peanut butter, maple syrup, coconut sugar and vanilla until the sugar has dissolved. Once dissolved pour over the popcorn and stir well, ensuring it’s evenly coated. Set to one side and allow to dry. Simply blend the frozen bananas and vanilla together in a food processor for a couple of minutes until it’s smooth and creamy. To achieve the swirl affect put the nicecream into a piping bag and pipe on top of the milkshake. This is best served immediately. Remove the jars from the freezer and use a teaspoon to drizzle chocolate sauce down the inside of the jars. The chocolate sauce should harden instantly. Divide the milkshake between the two jars and pipe the nicecream on top. Drizzle over some caramel sauce and top with a handful of popcorn. Drizzle over any additional chocolate you have left.